When working with media and reagents used to culture microorganisms, aseptic technique must be practiced to ensure contamination is minimized. A variety of plating methods are routinely used to isolate, propagate, or enumerate bacteria and phage, all of which incorporate procedures that maintain the sterility of experimental materials. Sanders, E. R. Aseptic Laboratory Techniques: Plating Methods. J. Vis. Exp. (63), e3064, doi:10.3791/3064 (2012). ● Perform plating procedures without contaminating media. ● Isolate single bacterial colonies by the streak-plating method. ● Use pour-plating and spread-plating methods to determine the concentration of bacteria. ● Perform soft agar overlays when working with phage. ● Transfer bacterial cells from one plate to another using the replica-plating procedure. ● Given an experimental task, select the appropriate plating method. Be familiar with all laboratory rules and safety precautions to be taken when working with microorganisms. Regardless of biohazard classification, all materials that come in contact with microorganisms are considered infectious waste and must be decontaminated prior to disposal. Follow safety guidelines in accordance with those provided by institutional Environmental Health and Safety departments, setting up appropriate waste receptacles for immediate and proper disposal of potentially contaminated materials (biohazards). Sterilize all instruments, solutions, and media prior to using them for plating procedures. Clear away all materials cluttering your work area on the laboratory bench. Clean work area with disinfectant to minimize possible contamination. Set up a Bunsen burner and work slowly, carefully, and deliberately within the sterile field area created by the updraft of the flame. If working with BSL-2 organisms, set up your work space in a Biosafety cabinet. A Bunsen burner cannot be used inside the cabinet because the heat from the flame disrupts air flow essential to its functionality. Arrange all the supplies needed for the procedure on the laboratory bench near the sterile field. Make sure all the materials are properly labeled. Organizing the work area to maximize work efficiency and avoid unnecessary movements will minimize the exposure time of experimental materials to airborne contaminants. Place the Bunsen burner to your right on the bench. Place agar plates or Petri dishes to your left. Arrange cell cultures, tubes, flasks and bottles in the center of the bench. Loosen the caps of tubes, flasks and bottles so they can be easily opened with one hand during subsequent manipulations. Wash hands thoroughly with antiseptic soap and warm water before handling microorganisms. The streak-plate procedure is designed to isolate pure cultures of bacteria, or colonies, from mixed populations by simple mechanical separation. 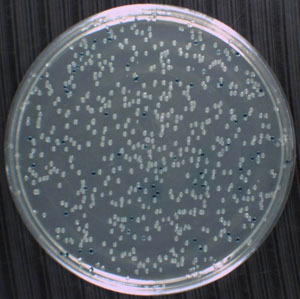 Single colonies are comprised of millions of cells growing in a cluster on or within an agar plate (Figure 1). A colony, unlike a single cell, is visible to the naked eye. In theory, all the cells in a colony are derived from a single bacterium initially deposited on the plate and thus are referred to as a clone, or cluster of genetically identical cells. Bacteria exist in a variety of shapes and sizes. For example, individual Escherichia coli cells are rod-shaped with an average length of 2 μm and width of 0.5 μm while Streptococcus cells are spherical with an average diameter of 1 μm. Some bacteria (such as E. coli) exist as single cells while others form distinct patterns of association. Streptococcus, for instance, grow in pairs or form chains or clusters of cells. It is generally assumed that a single colony arises from a single cell undergoing binary fission; however, this assumption is not true for those bacteria that naturally exist as pairs, chains, or clusters or that divide by other mechanisms. Alternatively, if too many bacteria are plated, then overlap of cells may occur and increase the probability of two or more bacteria giving rise to what appears to be a single colony. To avoid these complications when describing or enumerating bacterial cultures growing on a solid medium, colonies are referred to as colony forming units (cfu). With the streak-plate procedure, a mixture of cells is spread over the surface of a semi-solid, agar-based nutrient medium in a Petri dish such that fewer and fewer bacterial cells are deposited at widely separated points on the surface of the medium and, following incubation, develop into colonies. The quadrant method for isolating single colonies from a mixture of cells will be described here. Streak-plating can be accomplished with a number of different instruments (Figure 2). A metal loop can be re-used multiple times and is utilized for streak-plating routine laboratory strains. Disposable plastic loops are available commercially and are used more commonly when working with BSL-2 strains in a Biosafety cabinet. Many research scientists prefer using disposable, pre-sterilized wooden sticks or flat toothpicks for streak-plating. These are an inexpensive alternative to disposable plastic loops and can be especially useful when working with an environmental sample such as soil that likely contains spore-forming bacteria. 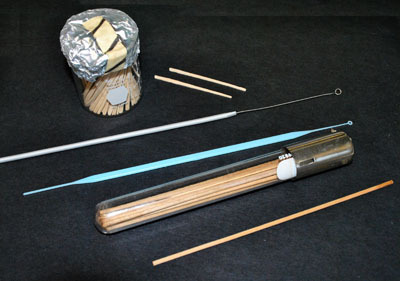 Disposable pre-sterilized sticks and toothpicks need not be flamed with the Bunsen burner thus preventing unnecessary aerosolization of spore-forming bacteria and cross-contamination of laboratory surfaces or agar plates with spores. Label around the edge of the bottom (not the lid) of an agar plate with at least your name, the date, the type of growth medium, and the type of organism to be plated on the medium. The plates must be completely dry without condensation on the lid and pre-warmed to room temperature prior to streak-plating. If the plates are stored at 4 °C, remove them several hours or even the day before. Spread them out in small, staggered stacks of no more than 2-3 plates and allow them to dry. The sample from which the streak-plate will be inoculated could be either a suspension of cells in broth or an existing colony from another agar plate. To begin, it is recommended that only one sample be used to inoculate a single plate. To save time and materials, a single plate can be used for multiple samples but only once you become proficient at streaking one sample on a plate. For the first quadrant, the sample is picked up and spread over about one-quarter of the surface of the medium using a rapid, smooth, back-and-forth motion (Panel A of Figure 3). Lift the bottom half of an inverted plate from the bench. Move the loop, stick, or toothpick back and forth many times across the agar surface from the rim to the center of the plate. If the inoculum is a cell suspension, obtain a loopful with a metal loop or 5 to 10 μl with a micropipettor. Be sure to swirl or vortex the cell suspension before removing an aliquot for plating. 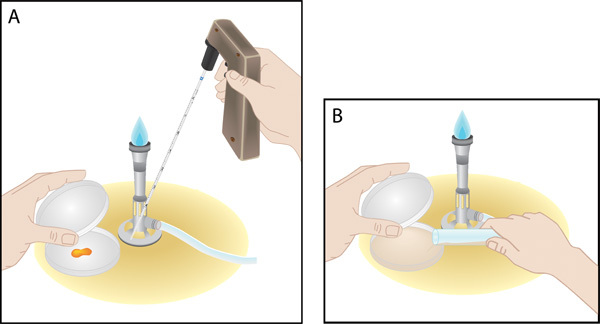 Use aseptic technique while performing this step, flaming not only the loop but also the rim of the bottle or tube before and after removing the inoculum. Also, do not touch the sides of the tube or bottle with the loop or barrel of the micropipettor. If pipetting the inoculum, dispense the cell suspension onto the appropriate place on the plate then use a loop, stick or toothpick to spread it over the first quadrant of the plate. If the inoculum is a colony from another plate, gently touch the colony with the loop, stick or toothpick then spread it over the first quadrant of the plate. Be sure the metal loop is cooled before touching the colony. To ensure the loop is not too hot, touch it lightly on the agar plate in a designated area where no streaking will occur. Only a few cells are needed from the colony, not the entire colony. If using a metal loop, flame it using a Bunsen burner before obtaining the inoculum for the plate (Panel B of Figure 3). Start about 3-4 inches from the loop, with the wire in the tip of the blue cone, the hottest part of the flame. The metal should become red hot. Move the wire so the flame approaches the loop. This manipulation prevents aerosolization of bacteria left on the loop from the previous usage. Flaming kills the bacteria (although not spores) and convection currents from the heated air prevent other airborne contaminants from settling onto the metal wire during subsequent manipulations. If using a sterile flat toothpick, hold the narrow end gently between your thumb and ring finger at a 10 to 20° angle to the medium, and use the wide end to streak the quadrants. If using a loop or wooden stick, hold it like a pencil at the same angle. Do not press so hard that the loop, stick or toothpick digs into the agar. After completing the first quadrant, invert and set down the plate back into lid on the bench. Dispose of the stick or toothpick or re-flame the metal loop as described in step #4. Turn the Petri dish 90 ° to streak the second quadrant. Lift the bottom half of an inverted plate from the bench then touch the loop, stick or toothpick to the first quadrant near the end of the last streak. Using the back-and forth pattern, cross over the last half of the streaks in the first quadrant then move into the empty second quadrant. Invert and set down the plate back into lid on the bench once the second quadrant is filled. The loop, stick or toothpick should never go back into the first half of the streaks in the first quadrant where most of the original inoculum was deposited. A new plastic loop, wooden stick or toothpick should be used for each quadrant. Repeat step #6 twice for the third and fourth quadrants. Be sure to dispose of the stick or toothpick or re-flame the metal loop between each quadrant. Avoid going into the first quadrant when streaking the fourth quadrant. Incubate the plate upside down so condensation that accumulates on the lid does not drip on the colonies. This method often is used to count the number of microorganisms in a mixed sample, which is added to a molten agar medium prior to its solidification. The process results in colonies uniformly distributed throughout the solid medium when the appropriate sample dilution is plated. This technique is used to perform viable plate counts, in which the total number of colony forming units within the agar and on surface of the agar on a single plate is enumerated. Viable plate counts provide scientists a standardized means to generate growth curves, to calculate the concentration of cells in the tube from which the sample was plated, and to investigate the effect of various environments or growth conditions on bacterial cell survival or growth rate. Open the lid of the empty Petri dish, and dispense your sample into the middle of the plate (Panel A of Figure 4). Close the lid. Open the lid of the Petri dish containing your sample and pour the agar in carefully (Panel B of Figure 4). Close the lid then mix the sample with the agar by gently swirling the plate. This technique typically is used to separate microorganisms contained within a small sample volume, which is spread over the surface of an agar plate, resulting in the formation of discrete colonies distributed evenly across the agar surface when the appropriate concentration of cells is plated. In addition to using this technique for viable plate counts, in which the total number of colony forming units on a single plate is enumerated and used to calculate the concentration of cells in the tube from which the sample was plated, spread-plating is routinely used in enrichment, selection, and screening experiments. The desired result for these three experiments is usually the same as for plate counts, in which a distribution of discrete colonies forms across the surface of the agar. However, the goal is not to ensure all viable cells form colonies. Instead, only those cells within a population that have a particular genotype should grow. The spread plate procedure may be employed over the pour plate technique for an enumeration experiment if the end goal is to isolate colonies for further analysis because colonies grow accessibly on the agar surface whereas they become embedded in the agar with the pour plate procedure. There are two strategies described here for the spread plate procedure. The first (Method A) involves use of a turntable and glass or metal rod shaped like a hockey stick. The second (Method B), referred to as the "Copacabana Method", involves shaking pre-sterilized glass beads. Both facilitate even spreading of cells across the agar surface. Include the dilution factor if plating serial dilutions. The plates must be completely dry without condensation on the lid and pre-warmed to room temperature prior to spread-plating. If the plates are stored at 4 °C, remove them several hours or even the day before. Spread them out in small, staggered stacks of no more than 2-3 plates and allow them to dry. Center the plate on the turntable (Figure 5). Obtain your sample, which should be a broth culture or a suspension of cells produced by mixing cells from a colony into buffer or saline. Sample volume to be plated should be between 0.1 and 0.2 ml. Open the lid of the Petri dish, and dispense your sample onto the center of the agar. Close the lid. Use a micropipettor to transfer your sample to the plate. Control the flow of the sample so it does not splash out of the plate. Dip the glass rod or metal rod (also called a spreader) into a beaker of 70% (v/v) ethanol. CAUTION: Never dip a hot spreader into a beaker of alcohol. The ethanol must only touch the bottom portion of the spreader and the first inch of the stem. Drain and ignite excess ethanol by passing it through the flame of a Bunsen burner. The flame should travel the length of the spreader and stem that came in contact with the ethanol then quickly extinguish. Should the beaker of ethanol catch fire, do not panic! Place a glass cover over the beaker, which will quickly extinguish the fire. Open the lid of the agar plate, holding the lid in your left hand with your thumb and index finger. Cool the spreader by touching it to the agar along the edge near the rim. Do not touch the agar where the cells were added. The hot spreader will kill the cells. With your left hand (while still holding the lid of the agar plate), spin the turntable slowly. Although best avoided, if you must put the lid down, place it face down on a disinfected surface within the sterile field of the Bunsen burner. With a lid that faces up, there is a greater chance of contamination from movements of objects or hands, creating air currents that cause microorganisms and dust particles to descend to the inside surface of the lid. With your right hand, hold the spreader gently on the surface of the agar and gradually spread the sample evenly over the entire plate. Move the spreader back and forth across the plate as the turntable is spinning. Allow the sample to absorb thoroughly (at least 5 minutes) before inverting the plate for incubation. Method B: Spread-plating with glass beads: the "Copacabana Method"
Open the lid of the agar plate, holding the lid in your left hand with your thumb and index finger. Then open the glass tube or bottle containing pre-sterilized glass beads. 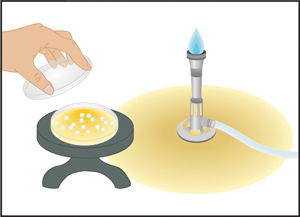 With your right hand, flame the rim of the tube or bottle then carefully dispense 10-12 sterile glass beads onto an agar plate (Figure 6). Close the lid of the plate, and flame the rim of the tube or bottle once again before replacing the cap and setting it aside. Gently pour the beads out of the tube or bottle a few centimeters above the agar so the beads do not bounce out of the Petri dish. Use glass beads that are 4 mm in diameter. Sterilize them in glass bottles or test tubes in the autoclave at 121 °C on the dry cycle (gravity setting) for 30 minutes. One advantage of using beads instead of a spreader is that no open containers of ethanol are required for repeated flaming. Open the lid of the agar plate, and dispense your sample onto the center of the agar. Close the lid. Aliquot 100 to 150 μl of sample per plate. This volume will facilitate even spreading of cells. Use a micropipettor to transfer your sample to the plate. Control the flow of the sample so it does not splash out of the plate. Spread the sample by gently shaking the beads across the surface of the agar 6 to 7 times. To ensure cells spread evenly, use a horizontal shaking motion. Do not swirl the beads or else all the cells will end up at the plate edge. HINT: If done properly, the procedure sounds like "shaking maracas". Rotate the plate 60° then horizontally shake again 6 to 7 times. Rotate the plate 60° a second time and horizontally shake again. By now, you should achieve even spreading of cells across the agar surface. When finished spread-plating, the sample should be absorbed and the surface of the agar should be dry. Pour off the contaminated beads into a marked collection beaker containing 10% chlorine bleach. Do not discard the beads in the trash! The used beads will be rinsed and autoclaved, re-sterilizing them for repeat usage. NOTE: If the agar surface is still wet after shaking three times, allow the plate to sit for several minutes to permit to the liquid to be absorbed by the agar, then repeat steps #4-6 until the plate surface appears dry. Invert the plate for incubation. This technique is commonly used to detect and quantify bacteriophage (phage), or bacterial viruses that range in size from 100 to 200 nm. An electron microscope is needed to see individual phage particles. However, the presence of infectious phage particles can be detected as plaques on an agar plate (Figure 7A). Phages cannot replicate outside their host bacterial cells, so propagation and detection requires mixing phages and host cells together prior to plating. For the soft agar overlay procedure, a small volume, generally in the range from 50 μl to 200 μl, of a phage suspension is dispensed into a tube containing about 108 bacteria (host cells) which are evenly dispersed in 2.5-3.0 ml of soft (0.5 to 0.7% [w/v]), melted nutrient agar. The resulting mixture is poured over the surface of a hard (1.5 to 1.9% [w/v]) nutrient agar plate. The plate is rocked sufficiently to ensure that the soft agar covers the entire surface of the hard agar. Then the plate is placed on a level surface until the top agar layer has had time to solidify and subsequently can be placed in the incubator. Over time, a cloudy suspension of bacterial cells, referred to as a lawn, becomes visible throughout the soft agar medium (Figure 7B). Plaques form if a phage infects one of the bacterial cells, replicates within the cell, then lyses the cell releasing as many as 100 progeny phages (a.k.a, the burst size). The new phage particles diffuse into the soft agar, infecting bacteria in the area surrounding the lysed bacterial cell. After multiple cycles of infection and lysis, the cloudy bacterial cell suspension in the soft agar disappears, leaving a zone of clearing called a plaque. Each plaque contains more than 109 phage particles, all genetically identical to the original infectious phage particle. Because a plaque arises from a single phage particle, the resulting number of plaque forming units (pfu) may be counted and the original concentration, or titer, of the phage suspension may be calculated. This type of experiment, called a plaque assay, also provides scientists a standardized means to generate one-step growth curves, to investigate host range specificity, and to transduce bacterial cells for genetic experiments. Prepare the indicator bacteria: An exponentially growing culture of the bacterial host strain needs to be prepared for the soft agar overlay experiment. Each host has its own growth requirements. Between 0.3 ml and 0.5 ml of a suspension of indicator bacteria is required for each plate. If a flask of indicator bacteria is prepared (e.g., 25 ml), the culture should be divided into smaller aliquots (e.g., 5 ml aliquots dispensed into sterile screw-capped tubes) to minimize possibility of cross-contamination. The tubes may be kept on ice (at 4 °C) until ready to use in the experiment. Use aseptic technique to inoculate sterile nutrient broth then incubate according to specifications of the bacterial strain. Leftover cultures should be discarded at the end of the day. Prepare adsorption tubes: Place two sterile microcentrifuge tubes in a rack. Label the lid of the first tube "Phage" and the lid of the second tube "Control". Typically serial dilutions of phage lysates are prepared and plated in which case additional microcentrifuge tubes would be added to the rack and labeled with the dilution factor. Phage stocks should be made fresh from single plaques and stored at 4 °C. To disaggregate phage particles, the stocks should be warmed up to ambient temperature prior to performing an experiment. Phage stocks should be handled gently - do not vortex or pipet vigorously. Add 50 μl of your phage sample to the first tube then add 50 μl of phage buffer to the second tube, which will serve as a negative control for the plaque assay. Use aseptic technique throughout all manipulations of phage and bacteria. Next add 500 μl of indicator bacteria to each adsorption tube. Bacterial cells will settle to the bottom of a tube if sitting on ice or the bench for long periods of time. If the culture is not mixed prior to removing an aliquot for the experiment, not enough bacterial cells will be transferred to the adsorption tube. 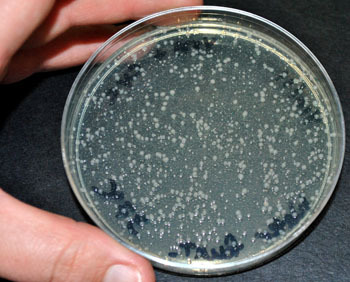 There must be sufficient numbers of bacterial colonies formed in the soft agar (i.e., a lawn) for detection of plaques. Use a vortex mixer to gently re-suspend the indicator bacteria into a homogeneous suspension before transferring aliquots to the adsorption tubes. Mix the bacterial cells and phage by gently flicking the tubes. Incubate the phage/bacteria mixture for 15-20 minutes (not longer than 30 minutes) at a temperature appropriate for the indicator strain. Prepare nutrient soft agar and hard agar plates: While adsorption is occurring, place two soft agar tubes (previously melted and stored at 55 °C) in a heating block at your laboratory bench set at 46-48 °C. The melted soft agar must be equilibrated to the temperature of the heating block for 10-15 minutes. If the melted soft agar sits longer than 15 minutes, it will begin to solidify and will form clumps when poured on the hard agar. If the melted soft agar sits less than 10 minutes, it will be too hot when added to the phage/bacteria mixture, killing host cells prior to plating. Consequently, a lawn may not form and few or no plaques may be detectable. Prepare additional soft agar tubes if plating serial dilutions of the phage lysate. Label around the edge of the bottom (not the lid) of two nutrient hard agar plates plate with at least your name, the date, the type of growth medium, and "Phage" or "Control" corresponding to the adsorption tubes. Include additional plates labeled with the dilution factor if plating serial dilutions. The hard agar plates must be completely dry without condensation on the lid and pre-warmed to room temperature prior to adding the soft agar. If the plates are stored at 4 °C, remove them several hours or even the day before. Spread them out in small, staggered stacks of no more than 2-3 plates and allow them to dry. Excessive moisture in the hard agar layer will cause dilution of the soft agar, allowing phage to diffuse more easily through the soft agar during plaque formation. Consequently, plaque size will increase. Plate adsorption tubes one at a time as follows: Use a P1000 micropipettor to aseptically transfer the phage/bacteria mixture (should be approximately 550 μl) to a soft agar tube then rapidly rotate it between the palms of your hands to mix the contents. Do NOT shake the tube so that air bubbles are introduced. Holding the tube in your left hand, open the lid of a hard agar plate with your right hand and immediately pour the entire contents of the tube onto the surface of a hard agar plate. Before closing the lid, rock the plate gently but rapidly to spread the melted soft agar over the entire surface of the plate before it has time to solidify. Avoid splashing the melted soft agar onto the sides of the Petri dish. Close the lid. Repeat step #9 for all adsorption tubes, one tube at a time. Place the plates on a level surface and allow them to stand undisturbed until the soft agar is solidified. Usually 30 minutes is sufficient. Invert the plates for incubation. Multiple plates may be stacked and taped together then inverted for incubation. Following incubation, the plates may be inspected for plaques. The negative control should have only a lawn of bacteria (no holes indicative of plaques). Plaques vary in terms of size, shape and overall appearance. A given phage type can be isolated from a heterogeneous mixture of plaques by carefully punching the center of one plaque with a sterile toothpick and transferring the inoculum to a sterile microcentrifuge tube containing 100 to 1000 μl of broth or phage buffer. This lysate can be plated using the same procedure described above. At least 3 to 6 successive single-plaque isolations are necessary to ensure that a pure phage has been obtained. Often the lysate must be diluted over a large range (10-1 to 10-10) to find a titer that produces non-overlapping plaques on a plate. The number varies depending on the size of the plaque. This technique permits comparison of cell growth on a primary plate to secondary plates, generating a means to screen cells for a selectable phenotype. First a primary, or master, plate is inoculated with cells either by spread-plating a dilution that produces single colonies or by transferring them to a plate in a spatial pattern specified by grid markings. Secondary plates containing media with growth inhibitors or media that lacks a particular nutrient are inoculated with cells from colonies on the primary plate. The spatial pattern of colonies is reproduced first by pressing a piece of velvet to the primary plate. Bacterial cells adhere to the velvet because they have greater affinity for the velvet than for the agar. The imprint of cells on the velvet then is transferred to multiple secondary plates with cell growth reflecting the same colony pattern as that of the primary plate. In other words, it is like having a rubber stamp, replicating the growth pattern from one plate to another. This technique is advantageous because it allows a relatively large number of colonies to be screened simultaneously for many phenotypes in a single experiment. Prepare primary plate: Label around the edge of the bottom (not the lid) of an agar plate with at least your name, the date, and the type of growth medium. Mark off a grid on the bottom of the plate with at least two equally spaced vertical lines and at least two equally spaced horizontal lines. Number the resulting squares. Use a pre-sterilized toothpick to inoculate each square with a cell sample. For each sample, dab the center of the square. Do not cover the entire square with cells (Figure 8) or else the sample will overgrow when incubated and contaminate surrounding squares. Each square will be inoculated with a different sample, derived either from broth cultures or colonies on another plate. Invert and incubate the primary plate, which will be used to inoculate various secondary media. Inoculate secondary plates: Stack the primary plate and all the secondary plates. With a marker, make an orientation mark on the side of the plates. Make sure the mark is on the bottom side of each plate, not the lid. Obtain a sterile velveteen cloth and place it on the cylindrical block (Figure 9). Lock the velveteen cloth in place with the holder. Note the orientation mark on the block. The block should be the same size as the bottom of a Petri dish (10.2 cm diameter). It should come with a locking ring that clamps the velveteen cloth to the block while replica plating. The velveteen cloth (15.2 x 15.2 cm square) must be pre-sterilized. Stack 10 or 12 clean squares then wrap them in aluminum foil then place them in the autoclave at 121 °C on the dry cycle (gravity setting) for 30 minutes. Before using them in a replica plating experiment, make sure they are completely dry by placing them in a warm oven for several hours. Note that velveteen squares may need to be de-linted with masking tape prior to sterilization. Velveteen squares may be re-used. After used velveteen squares have been decontaminated in the autoclave, they should be rinsed in plain water and re-sterilized as described above. The cylindrical block and clamp should be disinfected between uses with a brief rinse in 70% (v/v) ethanol or 10% chlorine bleach. Remove the lid and invert the primary plate. Line up the orientation mark on the plate with the mark on the block. Lower the plate so that the surface of the agar is in contact with the velveteen cloth on the cylindrical block. Lightly but evenly press down with your finger tips on the back of the primary plate and then carefully lift the primary plate away from the block. Replace the lid on the plate. The velvet impression of cells from the primary plate can be used to inoculate approximately 7-8 secondary plates before an impression with a new velvet needs to be made. Repeat step #7 with each of the secondary plates. As a positive control, the last plate in the series should be an agar medium in which all strains tested should grow. This way you can confirm that cells were transferred to all secondary plates in the series. Otherwise, lack of growth on a particular test medium may be ascribed to insufficient cell transfer rather than a phenotype of the strain. To avoid false positives, the secondary plates should be ordered from least to most favorable substrate. Otherwise, nutrients could be transferred between plates allowing cells to grow on an unfavorable medium. Invert the plates and incubate. Note: When inspecting the secondary plates for growth, be sure to distinguish between growth and an imprint. The latter is a negative result. Turn off the Bunsen burner then put away all supplies including cultures on plates or in tubes, extra media, and other reagents. Do not allow old cultures, whether on plates or in tubes, to accumulate on the laboratory bench or in storage areas. These samples, which are notorious sources of contamination such as molds and unwanted bacterial species, should be discarded as soon as they are no longer needed. Place contaminated labware (gloves, pipette tips, kimwipes), glassware (tubes, flasks, bottles), and hazardous waste (bacterial cultures or phage solutions, used plates) into the proper disposal receptacle. When working with a non-pathogenic E. coli strain (BSL-1), only non-infectious hazardous waste is generated. When performing these same procedures with pathogenic organisms (BSL-2 or above), infectious hazardous waste is generated. Regardless of biohazard classification, hazardous waste must be autoclaved or disinfected before it is discarded. Follow the guidelines described in the BMBL (5th Ed.) as well as those provided by your institutional Environmental Health and Safety department for the immediate and proper disposal of biohazards generated during an experiment. Clean the work area with disinfectant. Wash hands thoroughly with antiseptic soap and warm water before leaving the laboratory. Streak-plate Technique. A sample application for streak plating is shown in Figure 1. This procedure is used for isolating bacterial colonies from mixed cell cultures and is by far one of the most important techniques to master in microbiology and molecular genetics. Each colony represents a population of cells that are genetically identical. For many downstream applications it is imperative to start with either a single colony or a pure bacterial culture generated by inoculating media with cells from a single colony. For instance, the morphology of individual cells within a colony can be inspected using a light microscope. Genetic identity can be assigned by sequencing the small subunit ribosomal RNA gene from genomic DNA isolated from a cell culture started with a single colony. And metabolic characteristics can be described by subjecting cells to various biochemical and physiological assays. Only by performing such experiments with pure cultures can one be certain of the properties ascribed to a particular microorganism. The results are not obscured by the possibility that the culture is contaminated. Technical errors may occur if the sterility of the instrument used to streak the cells across the plate is not maintained throughout the procedure. Forgetting to flame a loop or retrieve a fresh toothpick between quadrants make it difficult to obtain single colonies. Some bacterial species cannot be isolated in pure culture as they are dependent on a cooperative association with another bacterial species for certain growth requirements. Referred to as syntrophs, these organisms may only be grown under co-culture conditions, so colonies (if formed) always will be comprised of two or more species. Another challenge encountered in the laboratory when performing the streak-plate procedure with bacteria derived from environmental samples is that cells exhibit growth characteristics that deviate from traditional laboratory strains such as E. coli. Such bacterial strains may produce colonies that are filamentous (as opposed to tight clusters of cells) with branches that spread over a large section of an agar plate, calcified and thus refractory to penetration by a streak-plate instrument, or surrounded by a sticky capsule so that individual colonies cannot be discerned. These characteristics make it difficult to purify single colonies by the streak-plate technique. Pour-plate Technique. With the pour-plate technique, the colonies form within the agar as well as on the surface of the agar medium thus providing a convenient means to count the number of viable cells in a sample. This procedure is used in a variety of industrial applications. For instance, it is critical for a wastewater treatment plant, which is responsible for cleaning up liquid waste (e.g., sewage, run-off from storm drains) generated by domestic, commercial, and industrial properties as well as agricultural practices, to analyze water samples following the extensive purification process. Treated wastewater (non-potable water) is reused in a variety of ways - for irrigation of non-food crops in agriculture, for sanitary flushing in residences, and in industrial cooling towers - so it must be free of chemical and microbial contamination. Drinking water (potable water) must be purified according to EPA standards and is tested using microbiological plating methods that allow enumeration of specific human pathogens. Shown in Figure 10 are bacterial colonies resulting from bacteria cells present in a water sample collected from a public drinking fountain. It is unlikely bacterial pathogens produced these colonies given the purification measures for potable water; however, microbes are everywhere and contamination by even non-pathogenic strains can be only minimized, not eliminated entirely. As another example, a pharmaceutical company needs to assess the degree of microbial contamination, or bioburden, of a new drug during production, storage and transport. By sampling the drug during various phases of the process and plating samples using the pour-plate procedure, the microbial load, or number of contaminating bacteria, can be readily determined. Precautionary measures then can be devised to minimize or eliminate microbial contamination. One of the most common technical errors that occurs when performing the pour-plate technique is insufficient mixing of the sample with the melted agar causing colonies to clump together thereby making plate counts inaccurate. Another frequent error is pouring the melted agar when it is too hot, killing many of the bacterial cells in the sample. This mistake also will affect accuracy of plate counts giving numbers that under-represent the total number of colony forming units in the sample. Spread-plate Technique. The spread-plate technique is analogous to the pour-plate procedure in its utility as a means to perform viable plate counts. However, because the colonies that form using the spread-plate technique are evenly distributed across the surface of the agar medium, cells from individual colonies can be isolated and used in subsequent experimental manipulations (e.g., as the inoculum for a streak-plate or a broth culture). Three common applications in which the spread-plate technique is an important component are enrichment, selection and screening experiments. In all three applications, the desired cell type can be separated from the mixture and later subjected to any number of biochemical, physiological, or genetic tests. An enrichment experiment involves plating a mixed culture on a medium or incubating plates in environmental conditions that favor growth of those microorganisms within the sample that demonstrate the desired metabolic properties, growth characteristics, or behaviors. This strategy does not inhibit the growth of other organisms but results in an increase in the number of desired microorganisms relative to others in the culture. Thus, the colonies that form on an enrichment plate likely exhibit phenotypic properties that reflect the desired genotype. For instance, if your goal is to cultivate nitrogen-fixing bacteria from an environmental sample containing a mixture of more than 1000 different bacterial species, then plating the sample on a nitrogen-deficient medium will enrich for those bacteria that can produce this compound from the atmosphere using metabolic capabilities provided by a suite of genes required for fixing nitrogen. A selection experiment involves plating a mixed culture on a medium that allows only those cells that contain a particular gene or set of genes to grow. This type of experiment is common in molecular biology laboratories when transforming bacterial strains with plasmids containing antibiotic-resistance genes. If your goal is to cultivate only recombinant cells, or those that successfully took up the plasmid, then plating the sample on a medium that has been supplemented with an appropriate concentration of the antibiotic will select for those cells that exhibit resistance to this particular drug. A screening experiment involves plating a mixed culture on a medium that allows all viable cells to grow; however, the cells with the desired genotype can be distinguished from other cells based on their phenotype. Again, this type of experiment is common in molecular biology laboratories when performing mutagenesis assays or cloning genes into plasmids. A classic example, as shown in Figure 11, makes use of the lacZ gene encoding β-galactosidase; this enzyme allows cells to metabolize X-Gal (5-bromo-4-chloro-3-indolyl-β-D-galactopyranoside), a substrate analog of its natural substrate, lactose. Cleavage of X-Gal by β-galactosidase results in an insoluble blue product. Thus, if a medium contains X-gal, and a sample containing cells with either a wild-type (functional) or mutant (non-functional) lacZ gene are plated on this medium, then following incubation wild-type cells harboring a functional lacZ gene will appear as blue-pigmented colonies while mutant cells with a non-functional lacZ gene will appear as unpigmented ("white") colonies. A technical problem encountered most frequently when first learning how to perform the spread-plate technique is uneven spreading of cells across the agar surface. When using a turntable and glass rod, the sample may be absorbed too quickly such that the colonies form only near the center of the plate. When doing the "Copacabana Method", the glass beads are swirled rather than shaken across the agar surface. Consequently, many colonies grow along the outer rim of the plate. In either case the resulting distribution of colonies does not take advantage of the complete surface area available so cells may clump together and grow into overlapping colonies making plate counts inaccurate or distinction of cell types unfeasible. Soft Agar Overlay Technique. A procedure akin to the spread-plate technique used to count bacterial colonies can be used to tally the number of phage. Whereas between 30 and 300 bacterial cells are spread over the agar surface for plate counts (cfu/ml), between 100 and 400 infectious phage particles are mixed with 108 to 109 host cells for plaque counts (pfu/ml) within a layer of soft agar spread across the surface of hard nutrient agar. Unless demonstrated otherwise, it is generally assumed that a single bacterial cell divides and accumulates large numbers of genetically identical cells in a single cluster called a colony. As discussed previously, this assumption is not valid when cells grow in bunches (i.e., pairs, tetrads, chains, or clusters) or display growth characteristics such as capsules that hinder single colony formation. A similar assumption is made for plaque formation, in that each plaque represents activity of a single phage. This statement is true only if one phage infects one bacterium. What happens if multiple phage particles infect a single bacterium? This problem relates to an important statistical parameter that must be considered when performing experiments with phage - multiplicity of infection (MOI) - describing the ratio of infectious phage particles to the number of host cells in a sample. Because some cells adsorb more than one phage while other cells adsorb only one or no phage, a population of host cells should be infected at a low MOI (≤1) to minimize the probability that a cell will be infected by more than one phage particle. Employing the plaque forming unit (pfu) as a functional definition avoids these complications when performing plaque counts to calculate the titer of a phage stock. As shown in Figure 12, plaque morphology varies for different phage. Some phage generate small plaques (panel A) while others give rise to large plaques (panel B). A number of variables affect plaque size. There are technical reasons that contribute to this variability. For instance, complete media and thick hard agar support development of larger plaques because host cells can sustain phage growth for a longer period of time. A high plating density of host cells (>109 cfu per plate) will cause a reduction in plaque size. Using lower concentrations of soft agar will increase the rate of phage particle diffusion in the soft agar and thereby increase the size of plaques. Recall that this increased diffusion rate can occur unintentionally if the hard agar plates are not completely dry such that condensation or excess moisture in the dish dilutes the soft agar in the overlay. This technical oversight will produce inconsistent results with respect to plaque size for a particular phage. Plaque size also is related to a number of host cell events including the efficiency of adsorption, the duration of the latent period (the time span from phage adsorption to lysis of the host cell), and the burst size (the number of progeny released by a single infection). A heterogeneous mixture of plaque sizes may be observed if phage particles infect host cells at different phases of bacterial growth. For instance, those that adsorb during early exponential phase make larger plaques with more progeny phage than those that adsorb in late exponential phase. As a general rule, lytic phage produce clear plaques while lysogenic phage form turbid plaques. However, some lytic phage produce interesting patterns such as the "bull's eye" plaque shown in Figure 12B. These clear plaques are surrounded by a turbid halo because those cells at the edge of the plaque are not fully lysed or may be resistant to phage infection. A "bull's eye" pattern observed with temperate phage is a plaque with a turbid center surrounded by a clear ring. This morphology reflects the MOI and the physiology of the host cell with respect to the lysis-lysogeny decision. When cells are first infected with phage, the MOI is low and cells grow rapidly because nutrients are abundant; together this facilitates lytic growth. As more and more cells are lysed, the MOI increases and a clear plaque forms. Lysogens in the center of the plaque, however, continue to grow because they are immune to lysis giving rise to a clear plaque with a turbid center. The overlay technique can be modified for plaque assays with eukaryotic viruses. In the same way bacteriophage form plaques on a lawn of bacterial cells in soft agar, eukaryotic viruses form plaques on a monolayer of cells covered by a gel. A monolayer is a confluent sheet of cells growing side by side on the surface of a culture dish, touching each other but not growing on top of one another. To carry out this type of plaque assay, aliquots of virus are added to susceptible monolayers of eukaryotic cells. Then the monolayer is covered with an agarose-based nutrient medium - this gel restricts the spread of progeny viruses released from infected cells to adjacent cells in the monolayer. Accordingly, a spherical area, or plaque, is produced that contains cells damaged by release of virions. To aid visualization of the plaques, dyes that stain living cells can be applied to the cell culture providing contrast between infected and uninfected cells. The soft-agar overlay technique is used for experiments other than plaque assays. First, it is significant to remember that the hard nutrient agar is a support matrix that permits growth of bacteria. Second, the soft-agar used for the overlay can have a different nutrient composition than the hard agar. In this way, the soft-agar can serve as a means to assay bacterial strains for various growth characteristics or metabolic properties. For instance, the overlay technique is used to screen bacteria for the ability to degrade cellulose (Teather and Wood 1982). 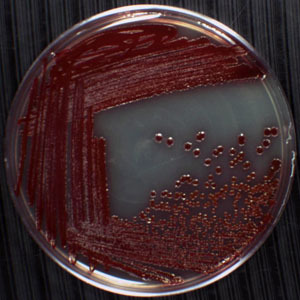 Single colonies are grown on a non-selective hard agar medium then soft-agar containing 0.1% (w/v) carboxymethyl cellulose (CMC) is spread over the surface of the hard agar. After incubation, the plates are flooded with stain that permits visualization of zones of clearing around the colonies in the soft agar. The clearing is caused by hydrolytic enzymes secreted by the bacteria breaking down the cellulose in the medium. More recently, the overlay technique has been used to detect bacteria that inhibit the growth of methanogenic Archaea found in the rumen of livestock (Gilbert et al. 2010). Bacterial isolates from environmental samples are grown on a hard agar nutrient medium then colonies are overlayed with soft-agar containing a culture of methanogens. After incubation, the plates are inspected for zones of growth inhibition around the colonies. This method identifies bacterial strains that produce inhibitors of the methanogens in the soft agar. The most common technical errors that occur with the soft-agar overlay technique are pouring the melted soft-agar either when it is too hot or too cool. If it is too hot, the bacterial cells mixed in the medium will be killed prior to plating. If it is too cool, then the soft-agar will form clumps when poured on the hard agar. In either case, the results will be ambiguous or unreadable at best. Replica-plate Procedure. Transferring cultures from one type of nutrient medium to another to test growth requirements becomes quite laborious if there are more than just a few strains. Replica plating is a method that permits simultaneous screening of a large number of microorganisms. For instance, after mutagenizing a culture of wild-type cells, one can spread-plate dilutions of the culture to obtain plates with single colonies. The primary plates contain a medium that supports growth of all cells including wild-type prototrophs, which synthesize all compounds required for growth, and mutant auxotrophs, which carry a genetic mutation in a biosynthetic pathway rendering them unable to synthesize particular compounds essential for growth. By plating the mixture of cells onto a complete medium, the missing nutrients can be taken up from the environment. To distinguish between prototrophs and auxotrophs, the colonies can be replicated onto a minimal medium. Only prototrophs will be able to grow. Because the spatial pattern of the primary plate is preserved, comparison of the secondary plate with the primary plate allows identification of mutant colonies. To determine which compound the mutants are no longer capable of synthesizing, the colonies can be replicated onto minimal media supplemented with specific compounds (e.g., amino acids, carbon sources, vitamins, etc.). In this way, hundreds of colonies can be screened at the same time using the replica-plate procedure. One technical error that could occur is using agar plates that are too wet, causing colonies to smear together contaminating all the cultures on the plate. This produces results that are entirely unreliable. Another technical error is applying too much pressure when transferring cells from the velveteen to the secondary plates. Again, after incubating the secondary plates, the resultant colonies may overlap producing growth phenotypes attributed to contamination rather than auxotrophy. Not all wild-type microbial species are prototrophs, so the replica-plate procedure can be used to simultaneously screen different wild-type strains for characteristic growth requirements. 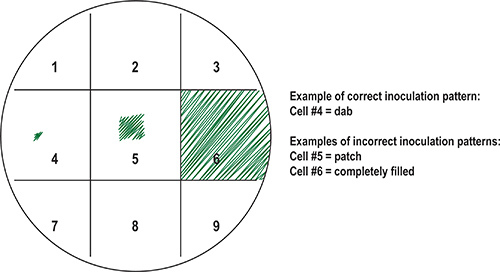 As shown in Figure 13, "dabs" of cells from four different Pseudomonas bacterial strains were plated in duplicate on a grid-marked plate containing complete media called YTA (panel A). The strains then were replicated onto three secondary plates (panels B, C, and D) composed of minimal medium (MSA) supplemented with a different carbon source (acetamide, lactose, and glycine, respectively). The results demonstrate that two of the four Pseudomonas strains (P. aeruginosa and P. stutzeri) are incapable of growing on these three carbon sources. As a control, the strains were replicated onto a fourth plate with YTA medium to confirm cells were transferred throughout the procedure. Since all four strains grow on the YTA control plate, the growth deficiencies exhibited on the previous three plates in the series are reliable. The replica-plating results are tabulated in Table 1. One error commonly made is interpreting an imprint of growth on a secondary plate as a positive result. For example, compare the phenotype of P. aeruginosa to that of P. stutzeri on MSA+acetamide (panel B). The latter displays an imprint of growth, which is a negative result, and can occur if nutrients from the previous plate are transferred with the parent cells. No new cell growth occurs because the missing nutrients are not available to progeny cells. It is easy to confuse an imprint with actual growth. If in doubt, the experiment should be repeated using an alternative method such as streak-plating cells from the primary plate onto secondary media. Figure 1. Example of single colonies on a plate. The pink spheres near the center of the plate are colonies of Serratia marcescens, a Gram negative, rod-shaped Proteobacterium in the family Enterobacteriaceae. Due to its preference for damp environments, this microorganism is commonly found growing in the corners of bathtubs, in sink basins, in tile grout, and on shower curtains. S. marcescens is easy to recognize since it produces a reddish pigment called prodigiosin. The colonies on this plate were generated using the streak-plate technique, with single colonies appearing in the fourth quadrant following incubation at 30 °C for 24 hours. The other three quadrants show confluent growth in which cells deposited on the agar surface developed into overlapping colonies. Figure 2. Instruments used for streak-plate technique. From top to bottom, shown are toothpicks (flattened not round), a wire loop, a disposable plastic loop, and wooden sticks. Toothpicks are typically transferred to a small glass beaker with the wide end down then covered with foil when autoclaved to sterilize prior to use. Wooden sticks are transferred to 18 mm test tubes then autoclaved to sterilize before use. Figure 3. (A) Streak-plate technique using the quadrant method. 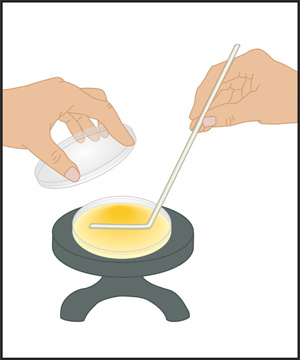 A pre-sterilized loop, stick or toothpick is used to spread the sample across one-quarter of the agar surface with a rapid, smooth, back-and-fourth motion from the rim to the center of the plate. This action is repeated for each of the four quadrants of the plate. Following incubation, cell growth appears along the path of the instrument used to deposit the cells on the plate. Mechanical separation of cells in a mixed sample using this technique should result in single colonies in the fourth quadrant (see Figure 1 for an example). Single colonies are referred to as colony forming units (cfu). (B) When a metal loop is used for streak-plating, it must be sterilized using the flame of a Bunsen burner prior to contact with the inoculum or the agar medium. Recall that the hottest part of the flame is the tip of the blue cone. Holding the handle of the instrument, place the wire in the flame about 3-4 inches from the loop. Leave it long enough for the wire to become red hot. Move the wire so the flame approaches the loop. Be sure the metal loop is cooled before touching the inoculum. Figure 4. Pour-plate technique. (A) A small volume of sample (between 0.1 to 1.0 ml) is dispensed aseptically into an empty but sterile Petri dish with using a 5.0 ml serological pipette. (B) Melted agar equilibrated to a temperature of approximately 48 °C is then poured into the Petri dish with the sample. After closing the lid, the plate is gently swirled to mix the sample and melted agar. The agar is allowed to solidify for about 30 minutes then plates are inverted for incubation. Figure 5. Spread-plate technique with a turntable and glass spreader. After the agar plate is placed on a turntable, a small volume of sample (0.1 to 0.2 ml) is dispensed aseptically onto the center of the plate using a micropipettor. The spreader is sterilized by dipping it into a beaker of ethanol then passing it through the flame of the Bunsen burner to ignite excess ethanol. Before making contact with the sample, the spreader should be cooled by touching it to the agar near the rim of the plate. The spreader is gently moved back and forth through the sample across the plate while the turntable is slowly spinning. This action allows gradual but even spreading of the sample across the agar surface. After closing the lid, the plate should be set on the bench top undisturbed for at least 5 minutes to allow the sample to absorb completely into the agar prior to inverting the plate for incubation. Figure 6. Spread-plate technique with glass beads (Copacabana Method). Glass beads that have been pre-sterilized in an autoclave are poured onto the surface of an agar plate sitting on the bench top. A small volume of sample (100 to 150 μl) is dispensed aseptically onto the center of the agar using a micropipettor. With the lid of the plate closed, a horizontal shaking motion is used to gently move the beads back and forth across the plate 6 to 7 times, spreading the sample. This action is repeated after rotating the plate 60°. The shaking motion is repeated a third time following another 60° rotation. Once the sample has completely absorbed into the agar medium, the beads are poured off into a beaker containing 10% bleach. The plates then are inverted for incubation. Figure 7. Soft-agar overlay technique used to isolate and enumerate phage based on the formation of plaques (also called a plaque assay). (A) The presence of phage can be detected as zones of clearing, or plaques, on a confluent suspension of bacterial colonies growing in the soft agar. Phage T4 is a virulent, double-stranded DNA phage that infects its host, Escherichia coli, causing the host cells to lyse and release progeny phage. After multiple rounds of infection and lysis, the neighboring E. coli cells in the immediate area surrounding the original infected host cell vanishes leaving a plaque containing billions of T4 phage particles. Phage T4 produces plaques that are approximately 1 mm in diameter. In this experiment, 200 μl of a 10-5 dilution of a 2 x 108 pfu/ml stock of Phage T4 was mixed with approximately 300 μl of E. coli indicator cells prepared as an exponentially growing, aerated culture at 37 °C. Both the phage and bacteria were added to an EHA soft agar tube, mixed, then poured onto the surface of an EHA hard agar plate. Note that it was not necessary to allow phage and bacteria to adsorb prior to plating in this case. After allowing the soft agar to solidify undisturbed for 20 minutes, the plates were inverted and incubated at 37 °C for 24 hours. (B) In the absence of infecting phage particles, bacterial growth results in a cloudy suspension of cells in the soft agar in which discrete colonies are not visible. Instead, an even lawn of bacterial cells, in this case E. coli, forms throughout the entire soft agar layer. Figure 8. Preparation of primary plate (master) with bacterial samples. To keep samples organized, the bottom of the plate can be marked into a grid and resulting squares numbered. Each sample can be assigned a square on the grid. Shown are examples of correct versus incorrect inoculation patterns. Ideally, a small number of cells are transferred to the center of the square using a sterile inoculation tool such as a toothpick to "dab" the sample (cell #4). Common inoculation mistakes, such as those depicted in cell #5 ("patch") and cell #6 ("fill"), result in overgrowth of bacterial samples following incubation, consequently contaminating adjacent squares. Figure 9. Replica-plate technique used to transfer cells from primary to secondary plates for phenotype screens. The mark on the primary plate is aligned with the mark on the velveteen covered block then lowered to allow the agar surface to contact the cloth. Cells are transferred from the plate to the velveteen by lightly but evenly pressing down on the primary plate with finger tips. This action will leave an imprint of the cell samples on the velveteen in the same spatial pattern as the primary plate. The same procedure is used to transfer cells from the velveteen to a secondary plate. As many as 7-8 secondary plates may be inoculated using the same primary plate impression on the velveteen. The last plate inoculated from the velveteen should serve as a positive control. It should be a medium that supports growth of all tested strains, ensuring sufficient cell transfer occurred throughout the entire series of plates. 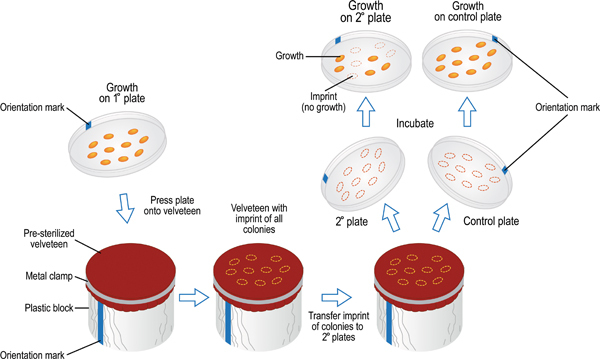 Following incubation, secondary plates may be inspected and scored for growth versus no growth. Thus, multiple bacterial strains can be screened simultaneously on several growth mediums in a single experiment. Figure 10. Example result using pour-plate technique. A 1.0 ml sample of water collected from a public drinking fountain was dispensed into a sterile empty Petri dish. Then melted but cooled YTA was poured into the dish with the sample. The agar also contained 100 μg/ml cycloheximide to prevent the growth of yeasts and molds that may have been present in the water sample. After gently swirling to mix, the plate was set upon a flat surface and the agar was allowed to solidify completely. The plate was incubated at 37 °C for 48 hours. Shown is the result of this experiment. Note the difference in appearance of surface colonies, which are large and circular in shape, versus sub-surface colonies, which are very small and irregularly shape because the solidified medium inhibits colony spreading in sub-surface. Figure 11. Example result using spread-plate technique. The "Copacabana Method" was used to plate a mixture of E. coli cells for a screening experiment. In this case, the growth medium (LB) contains X-Gal, so those cells expressing a functional β-galactosidase enzyme form blue colonies while those cells with a mutation in the lacZ gene and thus unable to express a functional β-galactosidase enzyme form white colonies. Often referred to as a "blue/white screen", the two types of colonies can be readily distinguished from one another on the same plate. Figure 12. Example result of plaque assay using soft-agar overlay technique. Shown are plaques formed on the host strain Mycobacterium smegmatis mc2155 (ATCC 700084) by two different phages: (A) Mycobacteriophage Destroyers and (B) Mycobacteriophage MSSS. These phage were isolated by students in the UCLA laboratory course MIMG 103L in spring 2010. M. smegmatis is a non-pathogenic Actinobacterium and belongs to a family of mycobacteria that includes a few pathogens known to cause serious diseases such as tuberculosis (M. tuberculosis, M. africanum, M. bovis) and leprosy (M. leprae). Approximately 50 μl of a 10-2 dilution of Destroyers and a 10-3 dilution of MSSS each were incubated with 500 μl of M. smegmatis for 20 minutes at 37 °C then mixed with MBTA (soft agar) and poured onto MHA (hard agar) plates. After allowing the soft agar to solidify undisturbed for 20 minutes, the plates were inverted and incubated at 37 °C for 48 hours. Note the distinct plaque morphologies produced by each phage. Destroyers (A) forms small (average diameter of approximately 1 mm), clear plaques characteristic of a lytic phage while MSSS (B) develops large "bull's eye" plaques with clear centers surrounded by a turbid halo (average diameter of approximately 3.2 mm). The hazy ring may be comprised of bacteria that are resistant to phage infection. This pattern is distinct from that formed by lysogenic phage, which produce turbid plaques. Figure 13. Example result using replica-plate procedure. 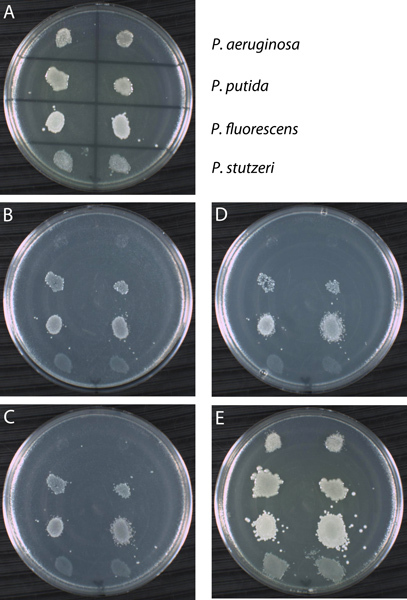 Four Pseudomonas strains (P. aeruginosa, P. putida, P. fluorescens, and P. stutzeri) were tested in duplicate for growth on three different carbon sources: acetamide, lactose and glycine. (A) The primary plate is a complete medium (YTA) inoculated with the four strains as indicated. Following incubation at 30 °C for 24 hours, all four strains grow on YTA. The primary plate was used to replica plate onto minimal medium (MSA) supplemented with a single carbon source: acetamide (B), lactose (C), and glycine (D). The last plate in the series was a positive control YTA plate (E). As shown, the strains show variable growth patterns following incubation on the secondary plates. Note that it is sometimes difficult to distinguish between growth and an imprint of cells. For instance, compare the imprint generated by P. stutzeri on the three MSA plates to no growth on same three plates by P. aeruginosa. Both are negative results in comparison to the growth patterns exhibited by P. putida and P. fluorescens. However, all strains grow on the positive control plate confirming cells were transferred to all secondary plates in the series. The results of this experiment are tabulated in Table 1. Table 1. Summary of replica plating results. Growth indicated as plus sign (+) and no growth represented as minus sign (-). YTA is a complete medium (yeast tryptone agar) and MSA is a minimal medium (minimal salts agar). The MSA plates were supplemented with a single carbon source as indicated. Culturing microorganisms involves a number of plating methods, all of which require that aseptic technique be maintained throughout the manipulation of cells and media. Five different procedures were described in this protocol. Although these plating techniques are routinely used to manipulate bacteria and phage, they also can be applied to mammalian cell culture and eukaryotic microorganisms commonly used in molecular genetics such as yeast (i.e., Saccharomyces cerevisiae, Candida albicans, Schizosaccharomyces pombe), algae and protozoa (i.e., Volvox, Chlamydomonas, Amoeba, Paramecium), and nematodes (i.e., Caenorhabditis elegans). There also are numerous (and even more sophisticated) variations of each plating method depending on the experimental goal or organism under study. Thus, it is important to not only select the most appropriate technique for a given experiment or target microorganism but also to tailor the methodology such that the experimental outcomes suitably address the research question or problem. Some of the most current applications of the plating techniques discussed in this protocol involve technological advances that yield high-throughput results for screening and drug discovery experiments. For example, genome sequencing centers use the "Copacabana Method" for spread-plating clone libraries, which are E. coli cells transformed with plasmids containing DNA fragments derived from the genome of a microorganism. Because dozens of large plates (called bioassay trays) are prepared at once, an automated plate shaker is used to shake the glass beads for the entire batch of trays. Furthermore, when selecting colonies from these plates following incubation, a robotic colony picker is used to collect cells from appropriate colonies as the inoculum for LB broth in 384-well microplates. For this high-throughput screening assay, the procedural principles of the spread-plate technique apply but technology allows various steps to be automated and scaled to permit a large number of samples to be analyzed simultaneously and within a short time frame. Biotechnology and pharmaceutical companies invest considerable resources in the development of high-throughput technology for the most basic techniques in microbiology and molecular genetics. For instance, there are multi-channel micropipettors to perform volume transfers for up to 8 or 12 samples at once. There even are robotic workstations that maneuver a 96-channel pipette head! These efforts involve multi-disciplinary teams of scientists, pairing biologists that possess methodological expertise with engineers and computer programmers who can develop the instrumentation needed to perform the mechanical operations associated with the experiments. Regardless of the research application, the goal shared by companies developing these technologies is the same - to automate laboratory processes, tools, systems and instruments, making them less labor intensive and more efficient. Special thanks to Cori Sanders at Iroc Designs for preparing illustrations and to Kris Reddi and Bhairav Shah at UCLA for setting up sample cultures and assisting with figures. Funding for this project was provided by HHMI (HHMI Grant No. 52006944). Autoclave at 121°C for 20 minutes to sterilize. Store at 4°C. If preparing tubes for the pour-plate procedure, allow the agar to cool to ~55°C then add 2.0 ml of 50 mg/ml cycloheximide. Aseptically dispense 18.0 ml of the melted agar per 18 mm tube then store at 4°C. The agar will solidify and will need to be melted in a steamer or microwave prior to use. * Carbon sources used for experiments presented in Figure 13 include acetamide, lactose, and glycine. ** Trace salts solution is prepared in 0.1 N HCl as follows. It is added to the base before sterilization (autoclave at 121°C for 20 minutes). Melt 50 ml of 2XTA and allow it to cool to ~55°C. Using aseptic technique, add the CaCl2 and 7H9 broth to the melted agar. Aseptically dispense 4.5 ml of the mixture per 13 mm tube and store in a 55°C incubator ≤7 days. Cooling MBTA to room temperature or 4°C will cause the CaCl2 to precipitate out of solution. * 100 mM CaCl2. stock must be stored at room temperature to prevent CaCl2 from precipitating out of solution. Mix the base with water then add the glycerol while stirring. Autoclave at 121°C for 20 minutes to sterilize. Store at 4°C. Autoclave at 121°C for 20 minutes to sterilize. Dispense 50 ml aliquots into 100 ml bottles and store at 4°C. Filter-sterilize this solution; do not autoclave. Store at 4°C. ** Filter-sterilize and store these solutions at 4°C for ≤60 days. Autoclave at 121°C for 20 minutes to sterilize. Allow the agar to cool to ~55°C then aseptically add 3.0 ml of 20 mg/ml X-Gal solution. Freshly prepare X-gal stock by dissolving 400 mg X-Gal in 20 ml dimethylformamide (DMF). Barker, K. At the Bench: A Laboratory Navigator. Cold Spring Harbor Laboratory Press. Cold Spring Harbor, New York. (1998). US Department of Health and Human Services (DHHS). Biosafety in Microbiological And Biomedical Laboratories (BMBL). 5th, U.S. Government Printing Office. Washington DC. Available from: http://www.cdc.gov/biosafety/publications/bmbl5/index.htm (2009). Dulbecco, R., Vogt, M. Some problems of animal virology as studied by the plaque technique. Cold Spring Harbor Symp. Quant. Biol. 18, 273-279 (1953). Fields, B. N., Knipe, D. M., Chanock, R. M., Hirsch, M. S., Melnick, J. L., Monath, T. P., Roizman, B. Fields Virology. 1, 2nd, Raven Press. New York, NY. (1991). Gilbert, R. A., Ouwerkerk, D., Zhang, L. H., Klieve, A. V. Cooperative Research Center for Beef Genetic Technologies. In vitro detection and primary cultivation of bacteria producing materials inhibitory to ruminal methanogens. Journal of Microbiological Methods. 80, 217-218 (2010). Jett, B. D., Hatter, K. L., Huycke, M. M., Gilmore, M. S. Simplified agar plate method for quantifying viable bacteria. BioTechniques. 23, 648-650 (1997). Karam, J. D. Molecular Biology of Bacteriophage T4. ASM Press. Washington, DC. (1994). Knipe, D. M., Howley, P. M., Griffin, D. E., Lamb, R. A., Martin, M. A., Roizman, B., Straus, S. E. Fundamental Virology. 4th, Lippincott, Williams, and Wilkins. Philadelphia, PA. (2001). Lederberg, J., Lederberg, E. M. Replica plating and indirect selection of bacterial mutants. J. Bacteriol. 63, 399-406 (1952). Miller, J. H. A Short Course in Bacterial Genetics: A Laboratory Manual and Handbook for Escherichia coli and related bacteria. Cold Spring Harbor Laboratory Press. Plainview, NY. (1992). Mills, K. V., Gareau, J. R., Garcia, A. M. Low-cost modification to the Copacabana method for spreading transformation mixtures. BioTechniques. 39, 188 (2005). Jordan, T., et al. RESEARCH: National Genomics Research Initiative Phage Resource Laboratory Manual. Howard Hughes Medical Institute. (2008). Sambrook, J., Russell, D. W. Molecular Cloning - A Laboratory Manual. 3rd, Cold Spring Harbor Laboratory Press. Cold Spring Harbor, New York. (2001). Sanders, E. R., Miller, J. H. I. Microbiologist: A Discovery-based Course in Microbial Ecology and Molecular Evolution. ASM Press. Washington, DC. (2010). Slonczewski, J. L., Foster, J. W. Microbiology - An Evolving Science. 2nd, W.W. Norton & Co., Inc. New York, NY. (2011). Teather, R. M., Wood, P. J. Use of Congo Red-Polysaccharide Interactions in Enumeration and Characterization of Cellulolytic Bacteria from the Bovine Rumen. Applied and Environmental Microbiology. 43, 777-780 (1982). Wise, K. Preparing Spread Plates Protocols. Available from: http://www.microbelibrary.org/index.php/component/resource/laboratory-test/3085-preparing-spread-plates-protocols (2006). Worthington, M., Luo, R. Q., Pelo, J. Copacabana method for spreading E. coli and yeast colonies. BioTechniques. 30, 738-742 (2001). American Type Culture Collection (ATCC). Available from: http://www.atcc.org/ (2012). EPA Microbiology Home Page. Available from: http://www.epa.gov/nerlcwww/index.html (2012). The GENE Project: Laboratory Methods and Materials. Available from: http://www.phys.ksu.edu/gene/g1.html (2012). Joint Genome Institute (JGI) Genome Sequencing Protocols: Library Plating Protocol. Available from: http://www.jgi.doe.gov/sequencing/protocols/prots_production.html (2012). Microbial Genetics (maintained by Stanley Maloy at UCSD). Available from: http://www.sci.sdsu.edu/~smaloy/MicrobialGenetics (2012). Organization of American States (OAS) Department of Sustainable Development (DSD). Available from: http://www.oas.org/DSD/publications/Unit/oea59e/ch26.htm (2012). Public Health Agency of Canada: Material Safety Data Sheets (MSDS) for Infectious Substances. Available from: http://www.phac-aspc.gc.ca/msds-ftss (2012). United States Environmental Protection Agency (EPA) Office of Water. Available from: http://water.epa.gov (2012). American Society for Microbiology (ASM)'s Curriculum Recommendations Microbiology Majors Program. Available from: http://www.asm.org/asm/index.php/unknown/asm-s-curriculum-recommendations-microbiology-majors-program.html (2012). Introductory Course in Microbiology. Available from: http://www.asm.org/asm/index.php/unknown/asm-s-curriculum-recommendations-introductory-course-in-microbiology.html (2012). I am not sure why you keep lots of care flaming your clean loop starting at the base and then up to the loop, but in contrast, flame directly the loop when it is full of bacteria. My suggestion is to flame always starting from the bottom of the wire and then up to the loop, which in theory may reduce the amount of aerosols produced. Shouldn't the scientist be using gloves?